The G250 supports the connection of PCs, LAN switches, IP telephones, analog telephones, and trunks, via fixed analog and PoE ports on the chassis. A media module slot supports either of two WAN media modules, for connection to a WAN. There are several models of the G250, with various port combinations for support of analog, BRI, or T1/E1 trunks or DCP telephones, as described below. Analog model (G250-Analog). The G250-Analog includes four analog trunk ports, two analog line ports, a Fast Ethernet WAN port, and eight PoE LAN ports. BRI model (G250-BRI). The G250-BRI includes two ISDN BRI trunk ports, one analog trunk port, two analog line ports, a Fast Ethernet WAN port, and eight PoE LAN ports. DCP model (G250-DCP). The G250-DCP provides twelve DCP (Digital Communications Protocol) ports, as well as four analog trunk ports, two analog line ports, a Fast Ethernet WAN port, and two LAN ports. DS1 model (G250-DS1). The G250-DS1 provides a T1/E1 and a PRI trunk port, enabling support of fractional T1/E1 and PRI. The G250-DS1 also includes one analog trunk port, two analog line ports, a Fast Ethernet WAN port, and eight PoE LAN ports. 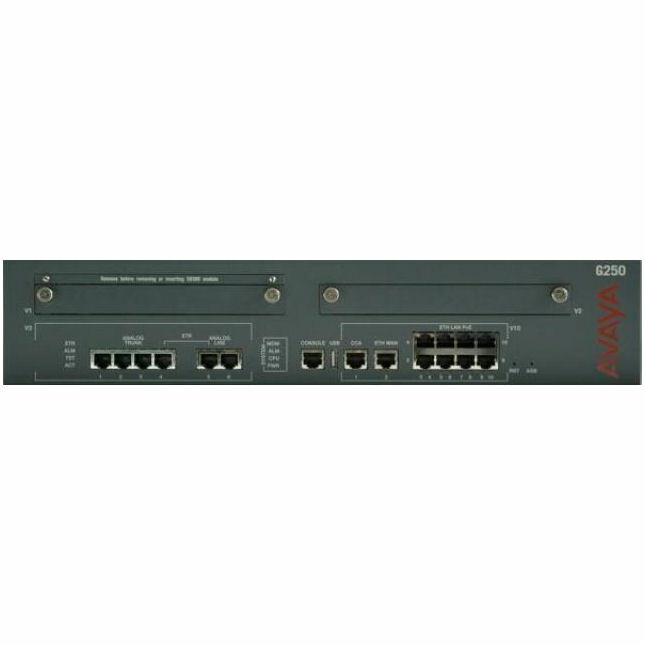 More Information about the Avaya G250 DCP I/F Media Gateway (700360654) on our Blog.